Originally built in 1908, theBattle CreekCentralHigh Schoolwas in need of an upgrade in order to meet current educational trends. The design challenge involved maximizing existing space and adding new space, equipment and materials required to create a powerful and creative learning environment that would accommodate over 1,400 students. The new addition included space for a physical education & fitness center, administration, food service and student dining/commons. 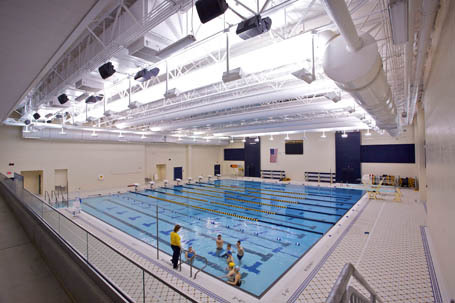 The Counsilman-Hunsaker/TMP Associates team provided architectural and engineering services to theBattle CreekPublicSchool Districtfor the design of the new state-of-the-art natatorium atBattle CreekCentralHigh School. The Battle Creek Central boys’ swimming program owns 16 state championships, and today for the first time in its storied history, the Bearcats can swim home meets on their own campus.